What is a Microsoft Exchange account? A Microsoft Exchange account is a work or school email account. The organization that gave you the Exchange email account is running a Microsoft Exchange Server, or is using Microsoft Office 365 which uses Exchange Server to provide email. What's the name of my Exchange server? You usually won't need to know the name of your Exchange server. If you do, contact the people who gave you the Exchange email address and ask them for the name of the Exchange server. When you set up a mobile device, the AutoDiscover feature will find the name of your Exchange server and mailbox, and configure Outlook for you. It uses the domain name in your email address to find the server. Only if Autodiscover fails will you be asked for the name of the Exchange server. At this point, usually something isn't working correctly and you’ll need to contact the people who gave you the email address. They'll tell you the name of your Exchange server and help you set up Outlook. When you use an Exchange account, your email messages are delivered to and saved in your mailbox on the Exchange server. Your contacts and calendar are saved there, too. Exchange ActiveSync; MAPI/HTTP are methods for accessing your Exchange email, usually from a laptop, phone, or tablet. When you access or read your email, you aren't actually downloading or storing email on your mobile device; instead you're reading it from the Exchange Server. It allows you to access your email even when you're not connected to the Internet. IMAP, like Exchange ActiveSync, is a method for accessing your email wherever you are, from any device. When you read an email message using IMAP, you aren't actually downloading or storing it on your computer; instead, you're reading it from the Exchange Server. With IMAP, email in your Inbox, Deleted Items, Sent Items folders are synchronized between your device and the server. IMAP allows for limited calendar storage but does not support collaborating on a calendar with other users. POP email is downloaded from the Exchange Server onto your computer. Once email is downloaded to your computer, it's deleted from the server. To access the email after it's downloaded, you have to use the same computer. If you access your email from different computer or device, it will look like some of your previously downloaded messages have been deleted. With an Exchange email account, you can work on your email messages even when you're not connected to the Exchange Server in your business's IT department. This is called working offline or using Cached Exchange Mode. Copies of your email and calendar items are kept on your computer in an offline Outlook Data File (.ost). This file is regularly synchronized with the items on the Exchange server in your business's IT department, when you are connected to it. It's an exact copy of your mailbox on your Exchange server. Because your data remains on your business's Exchange Server, you can re-create this offline Outlook Data File (.ost) on a new computer without having to back up the file. The offline Outlook Data File (.ost) can only be opened by the Outlook profile on the computer that created it. You can check the Account Settings in Outlook to see the types of email accounts in your Outlook profile. On the menu, select File, then Account Settings and Account Settings. On the Email tab, the Type column lists the type of account for each entry. Note: To access some Outlook features, your account might need to be on a specific version of Exchange Server. 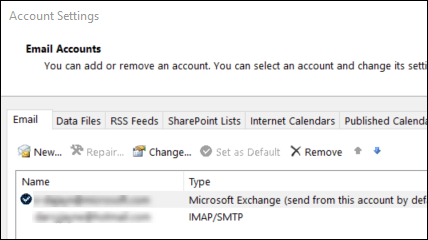 To determine which version of Exchange Server your account connects to, see Determine the version of Microsoft Exchange my account connects to.